“Some of the best ribs I’ve ever had.” – My wonderful fiancé who really really likes his ribs. If you’re like my fiancé and truly appreciate a delicious plate of ribs then this recipe is for you. No joke, he actually said that these were some of the best ribs he has ever tasted … excuse me!? Can you say that again? Put it in writing? Billboard? Please, and thank you. In all seriousness though, I really don’t think the success of this recipe had anything to do with the fact that I made them … as much as I’d like to think so. The recipe is just that good. The combination of the savory marinade with the honey glaze and the sweet and spicy dipping sauce make this recipe exceptional. It takes a bit of time, but if you’re willing to put in the effort I really think this recipe is so perfect that it’s fool proof. A few notes on my own experience with this recipe. It calls for spare ribs. The Asian market I visited only had baby backs so I went with those. They worked great! The recipe recommends the ribs being cut across the bone into 2” strips. I highly recommend this as well. I was able to purchase them this way from the Asian market. Don’t disregard the recommendation to serve with the jaew sauce. It is so good! I didn’t think it tasted very good when I first made it but after it sat in the fridge overnight and I added the cilantro it really came together. It really made this dish pop. So, here it is – Chok dii! In a bowl, whisk together 2 tablespoons of honey with the soy sauce, Shaoxing wine, ginger, sesame oil, pepper, cinnamon, and nutmeg until the honey has dissolved. Put the ribs in a large resealable plastic bag and pour the marinade over the top. Close the bag, expelling excess air. Massage the bag to spread the marinade around. Refrigerate for 2 hours or as long as overnight. Before cooking the ribs, mix together the remaining 4 tablespoons of honey with 2 tablespoons of hot water. Set aside to use as a glaze during the last hour of cooking. Preheat the oven to 250F and line a rimmed baking sheet with foil. Put the ribs on the rack leaving at least one inch between the racks. Bake for 2 hours, flipping the ribs and rotating the baking sheet once or twice. After two hours, increase the heat to 300F and continue to cooking for 30-40 minutes, brushing on the honey every 10-15 minutes. The ribs should have a dark lacquered surface when they are finished. When finished cooking, remove from the oven and transfer to a cutting board. 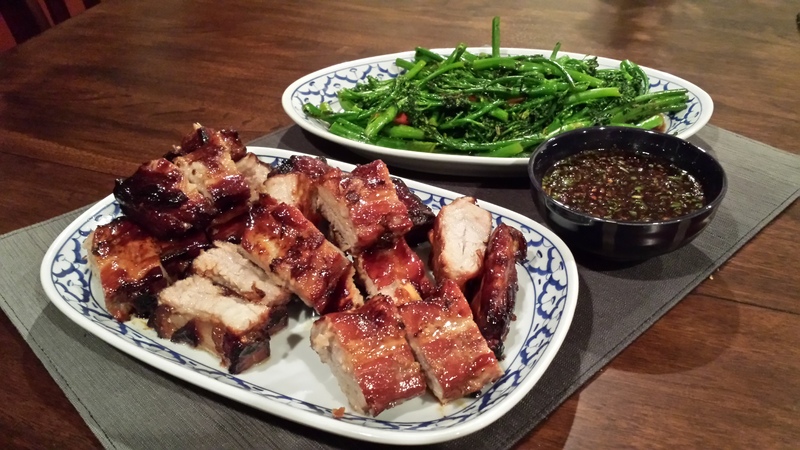 Let the ribs rest for a few minutes, then slice into individual ribs and serve alongside the jaew dipping sauce. This dish is not complete without the recommended jaew dipping sauce. Give it a shot! Pound the lemongrass in a granite mortar until you have a coarse, fibrous paste. You can also use a mini-processor but this will not break up the fibers as well. You can also buy lemongrass paste instead. Scrape the paste into a medium bowl and add fish sauce, soy sauce, seasoning sauce, lime juice, simple syrup, and chile powder. Let sit at room temperature for at least one hour or in the fridge for up to two days. It really does get better with a little time! Right before serving, let it come to room temperature and stir in toasted-rice powder and cilantro.